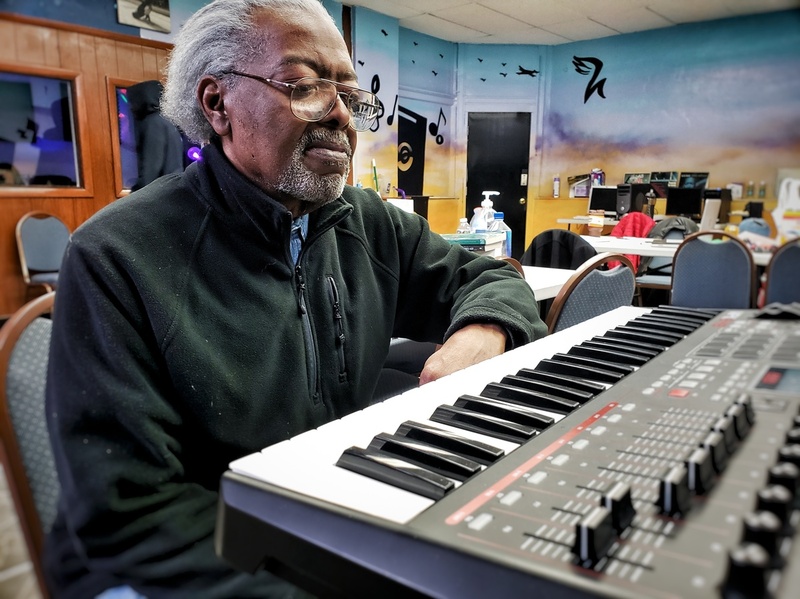 New Chicago Hip Hop Trap Music Artist Is 72-Year-Old Grandfather Arthur Dubois The Chicago native's beats went viral this week after videos of his trap music started circulating on social media. Arthur Dubois works on making music at Haven Studios on Chicago's South Side. Arthur Dubois isn't your typical grandfather. That's because at 72 years old, the Chicago resident is a newly discovered hip-hop artist. This week, Dubois walked into Haven Studios, a music mentoring program on the South Side of Chicago that supports young aspiring artists. The owner of Haven Studios, Andre "Add-2" Daniels, said Dubois claimed he was "young at heart." So, Daniels decided to listen to Dubois' music. He was quickly floored. In one track, the song kicks off with a high-pitched clinking, then quickly gets joined by louder synthetic tones and a stronger beat. The music feels youthful, and it's easy to imagine Dubois' beats blasting in a dance club. Daniels quickly took videos showcasing Dubois' talents and posted them to Twitter. His tweet went viral, garnering thousands of reactions within a matter of days. Now, Dubois' talents have even caught the attention of some famous hip-hop producers. "It's not what you would expect, right?" Daniels says in one of the videos. Dubois music is playing in the background, giving a steady beat that easily invites listeners to dance. As for Dubois himself, he stands by nonchalantly, dressed in a plain black coat with a black baseball hat to match. It's perhaps especially unexpected because the subgenre of hip-hop that Dubois is dabbling in, trap music, only rose to popularity in the late '90s and early 2000s — well after Dubois's youth. It's a style that Dubois said is entirely self-taught. He first started teaching himself to produce hip-hop beats about six years ago, after he retired. "I found something to do," he told NPR's Scott Simon. "I had to learn how to do the computer and music at the same time." Dubois taught himself by using the audio editing softwares Mixcraft and Pro Tools. Now he's learning another new skill — social media. Dubois' newfound social media fame has been a little overwhelming for him. "I was shocked," he said. "I broke down and cried because I didn't know that many people liked me." Daniels has helped Dubois set up accounts on Twitter and Instagram for his fans to follow. "I'd never used Instagram, Twitter and all that other stuff," Dubois said. "Because I didn't believe in that stuff myself. But now I've got to have it." The attention doesn't seem to have gone to Dubois' head though — he doesn't really care about getting famous or making money. "I just want to put it out there and let other people hear my music. I don't care about the Grammy's or nothing like that. Just that people – they know where I am." His only plan currently is to keep dropping beats.